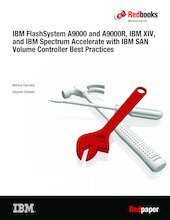 This IBM® Redpaper™ publication describes preferred practices for attaching members of the IBM Spectrum™ Accelerate family, including the IBM XIV® Gen3 Storage System, IBM FlashSystem® A9000, IBM FlashSystem A9000R, and other IBM Spectrum Accelerate™ based deployments, to either an IBM System Storage® SAN Volume Controller or IBM Storwize® V7000 system. The paper also explains what to consider for data migration when done in combination with a SAN Volume Controller or a Storwize V7000 system. In addition, this publication describes data reduction, and where it is appropriate to enable data reduction.